It is Spring Break time again here in good ole College Town, USA, which really just means that the students have evacuated to parts unknown leaving the streets a bit easier to navigate and restaurants to close super-early because what business is going to stay open when there are no students to buy their over-priced beers and sandwiches? Or, if you don't work or live close to either campus, it's just another week at home. Sometimes a girl just needs a book that doesn't require a lot of brainpower, a book that is just a fun distraction. Stephanie McAfee's Diary of a Mad Fat Girl is just that. A silly book about a small country town where your business is everyone's business, breakups, and the girlfriends that will help you through anything. To me, this is the epitome of what a Spring Break/Summer at the beach book should be. The main character, Ace Jones, grew up in Bugtussle, Mississippi. It's there where she found out that her parents had died, there that she met her true love Mason McKenzie , and there that she feels imprisoned to. While she dreams of painting in Paris, of opening her own art studio, of running away to a new town somewhere, anywhere she just cannot find the courage to leave Bugtussle behind. Instead, she is the art teacher at the same high school that she graduated from, lives in the house that she grew up in, and bristles at the idea of change. While there are a lot of funny high moments in the book, the ending of the book is too quickly wrapped in a pretty bow and delivered on a silver platter. There are just too many moments where there are no repercussions for any of the actions for Ace or her friends. Which, again, is why it is a great book for Spring Break or Summer vacation, but not a book that I take too seriously. 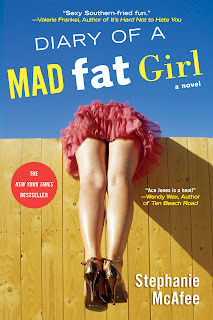 I would definitely say that if you are looking for light reading over Spring Break or while sunning yourself on a beach, Diary of a Mad Fat Girl is the book you are looking for. If you are looking for a quick, easy distraction from a life gone way too crazy, this is a good book to take your mind off of your woes. I also think that this book would be fine for older teenage girls. There are some moments where the subject matter starts to get a little steamy, but nothing so bad that a 15 or 16 year old has not already heard or seen something way worse. This is a paid review for the BlogHer Book Club. All opinions and statements in this review are my own. And, today, I am doing something a bit different! Leave a comment below telling me what your favorite guilty pleasure distraction book is and you will be entered to win my copy of Diary of a Mad Fat Girl! 1. You must like Momma's Time Out on Facebook to enter. 2. You must leave a comment below. 3. You must live in the U.S. I can't afford to ship out of the country right now. 4. Extra entry if you comment on Blogher's post regarding Diary of a Mad Fat Girl pertaining to the post and come back here to tell me about it. I will draw a name randomly (actually Supergirl will draw a name randomly) on St. Patrick's Day, March 17, 2012 and announce the winner on March 18, 2012.